What’s That Wild Thing Under Your Tree? Luckily, WWF-Canada has found a clever way to pull at our heart strings, protect wildlife and give a cute, meaningful gift. Just in time for the holiday season, they are arranging adoptions for species at risk. 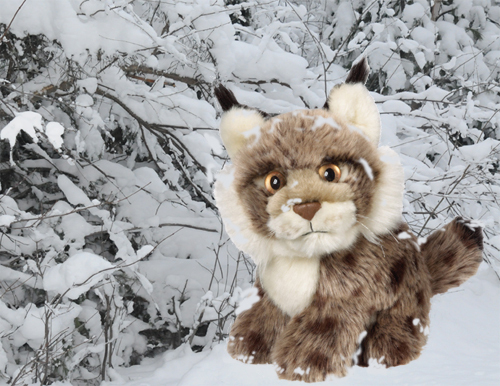 Their Wildlife Adoption Program is symbolic — which is probably a good thing as a cute, stuffed toy lynx is much cuddlier (and safer) than a real one! These solitary felines can range in size from that of a small housecat to being 6 times larger. The lynx population is heavily dependent on the availability of its prey. With development depleting its primary source of prey, it is increasingly difficult for these cats to hunt. Caribou are an ancient member of the deer family with a population that is spread widely across Canada. Fragmentation and conversion threaten caribou habitats and have seen its populations greatly diminished. This large and notably strong land mammal is often thought to be a carnivore. The grizzly is however an omnivore with up to 85% of its diet made up of roots and berries. Habitat loss due to human encroachment poses a large threat to grizzly populations. This strikingly beautiful and elusive creature has a soft fur, a tail almost as long as its body, and is one of the members of the feline family that does not roar. Sadly, the snow leopard population has been greatly diminished because of illegal hunting and habitat loss. Although the arctic fox has evolved to be able to withstand living in some of the most frigid extremes on this planet, its population is threatened by climate change. Melting sea ice due to climate change has limited the arctic fox’s access to its food supply while industrial development disturbs its natural habitat. Go to WWF-Canada to see all the animals available for adoption. WWF-Canada’s symbolic wildlife adoptions are available with free shipping for pre-Christmas delivery until December 17 in Canada. Orders can be placed at https://wwfstore.donorportal.ca/c-11-wildlife-adoptions.aspx or 1-800-26-PANDA (1-800-267-2632). Funds from the adoptions are used to fight major threats like climate change and animal poaching, and to support WWF’s conservation efforts across Canada.